Need more information about booking Home 9161711 ? 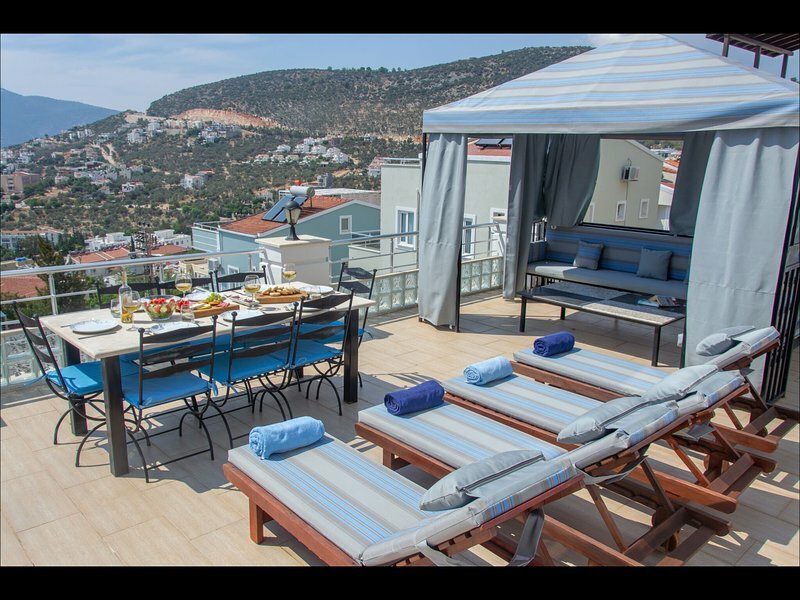 Stunning Villa Sienna is situated in the kiziltas area of Kalkan, a 10 minute downhill walk into beautiful Kalkan town. Villa Sienna is a beautiful detached modern villa with stunning seaviews and a spacious garden with its own private pool with large dining area and BBQ. The pool is area has 8 loungers and bean bags for lazy days around the pool with a tented gazebo area. There is also a lovely roof terrace with a table & chairs. A large dining table for 8 can also be found by the pool area, the perfect place for breakfast or dinner. The Villa is fully equipped for self catering, dishwasher, washing machine. A large spacious lounge with TV & DVD player and plenty of comfy seating for 8 people. Access to the roof terrace, perfect to enjoy the view on warm evenings. Or morning coffee, watching the boats depart from the harbour. Villa Sienna is perfect for a large family holiday, or couples traveling together as it still offers privacy. The villa is fully managed by our local management team who are on hand 24hrs, daily pool clean and rubbish collection from the villa. Welcome pack on arrival Mid week cleaning. In house catering, can be arranged at an extra fee - for those special celebrations. If you have any special requests please ask and I will endeavour assist. Please enjoy your stay at our lovely home. Estimated price per night based on a weekly stay. Owner fees of $2.00 per stay may apply. Enter your dates to see the total cost.